I frequent my local thrift stores weekly. So, clearly I make a day of it and hit *most* of the thrift stores over there. I should really be saying “we” since I couldn’t do this without my awesome hubby. Who happens to have a truck to haul all the great stuff back. 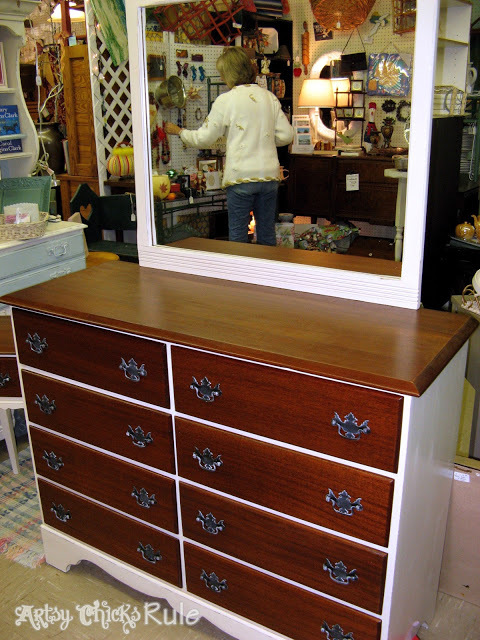 So on this particular visit, to the other side of the water, I found this great Mahogany Dresser. Of course it didn’t look like this when we found it. It had long since seen any love and was completely scratched and beat up. But with beauty just beaming from beyond. Poor thing…. but how can you beat it for $35? That is just a steal. Like I’ve said, it’s amazing what you can find at thrift stores! 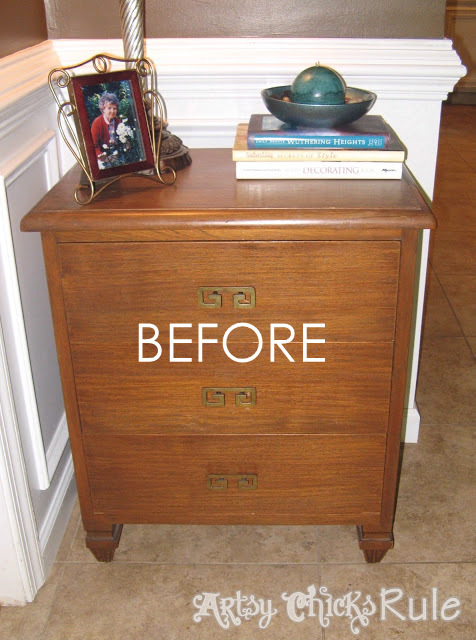 A little work and you have a gorgeous, like new (better) piece of furniture to be re-loved. I had originally thought I would paint it. I love paint. I do love wood finishes though. I really do… I just really love paint and color. BUT….I just couldn’t do it. Well for the most part anyway. 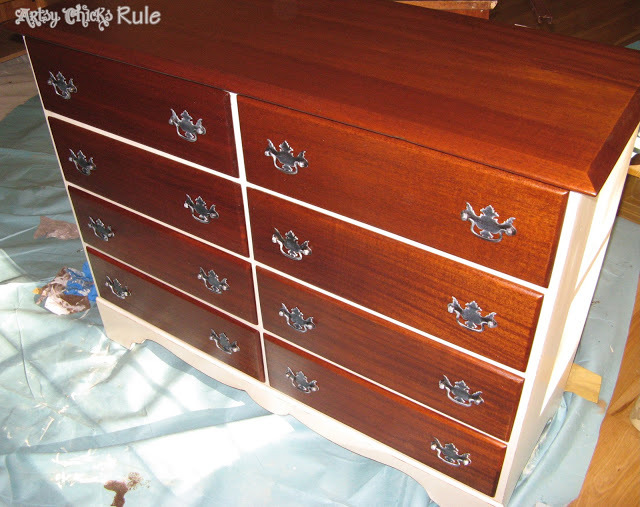 Such gorgeous wood so I decided to only paint part of it. And just in case y’all didn’t know… I HATE sanding. I’m actually not sure anyone likes sanding, right? I know I’m right on that one. But I got to it anyway…. 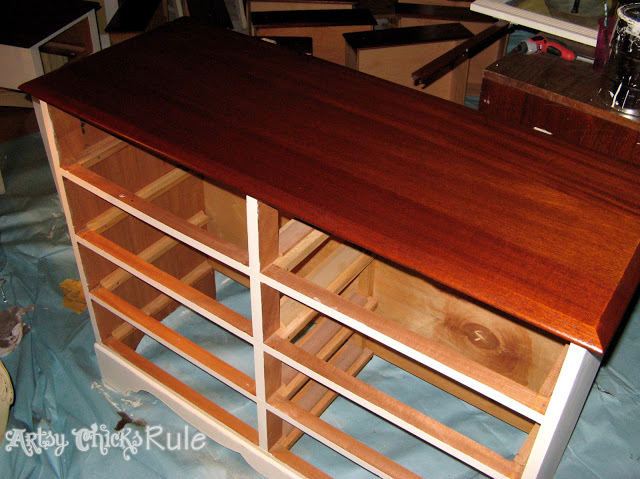 The one (and only) great thing about sanding is seeing that gorgeous wood on this mahogany dresser come to life underneath. Isn’t that just great? Look at the wood. And why yes, I am sanding on my screened porch but that is due for a re-do too. And my hubby was so great to clean up the mess after. 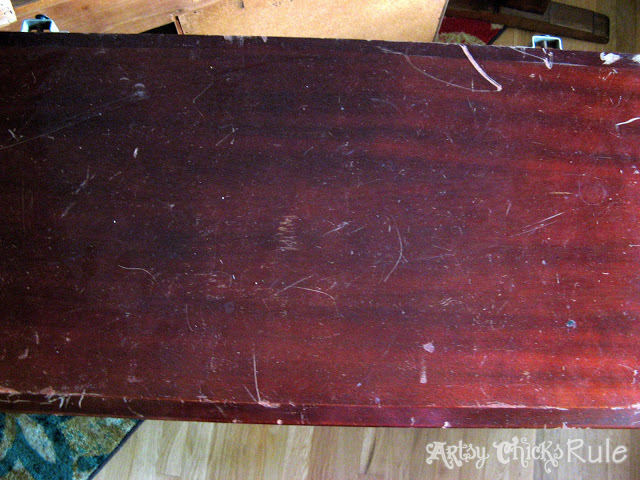 After wiping it down really well I applied the Minwax Pre Stain Conditioner to the areas I was planning to stain. Look at the richness of the wood and that’s before poly. 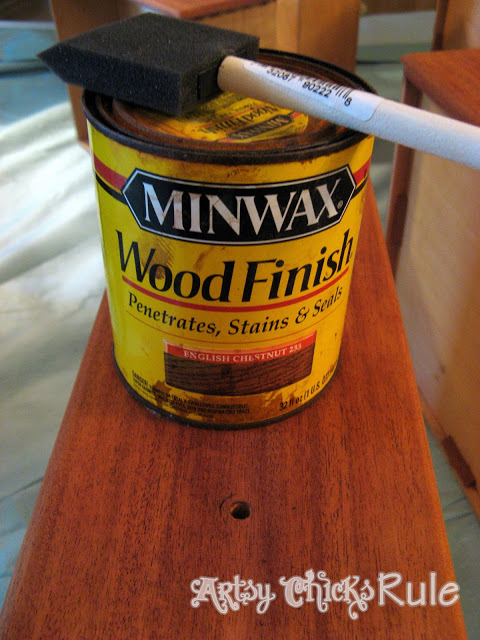 The base of the dresser was sanded lightly then primed with Sherwin Williams Adhesion Primer. 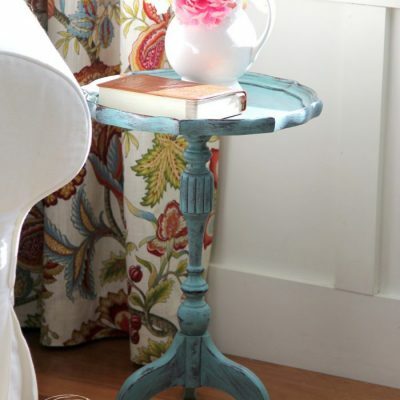 I used a color I mixed over top of that which was also Sherwin Williams. Basically a creamy, off white. 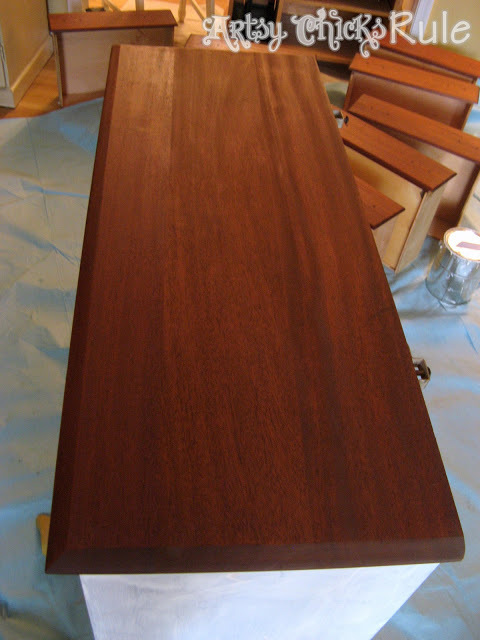 For the finish I used several coats of MinWax Wipe On Poly in Satin. I distressed the paint slightly to bring out the details and added a bit of glaze. I put a coat of Minwax Polycrylic (also in Satin) over the painted finish. The hardware got a coat of Oil Rubbed Bronze spray paint and a bit of dry brushing with the same paint used on the base. 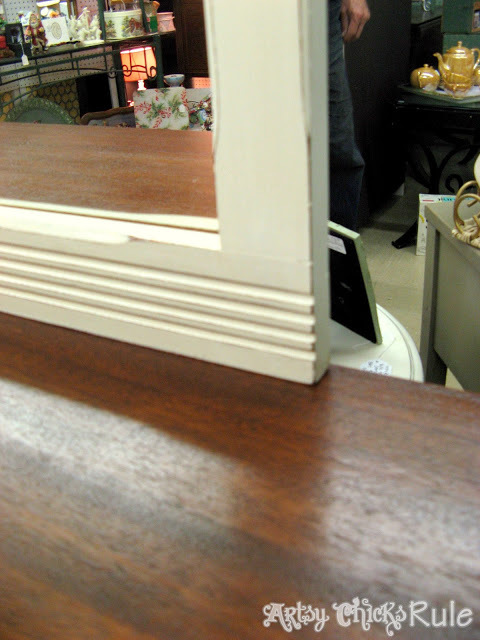 I also painted the mirror surround. It had great detail that was brought out when I distressed it. I would have loved to have taken better pictures but I was in a hurry to get this one to the shop. A few of these pictures are from my phone so they’re not the greatest! This was one of my more labor intensive projects, with the sanding and all, but it was worth it. I still love my paint! 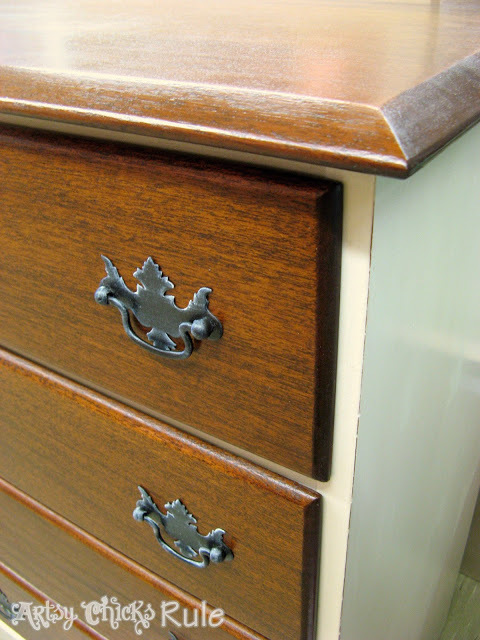 But the beauty of this mahogany dresser wood just shines and I’m so glad I allowed it to! 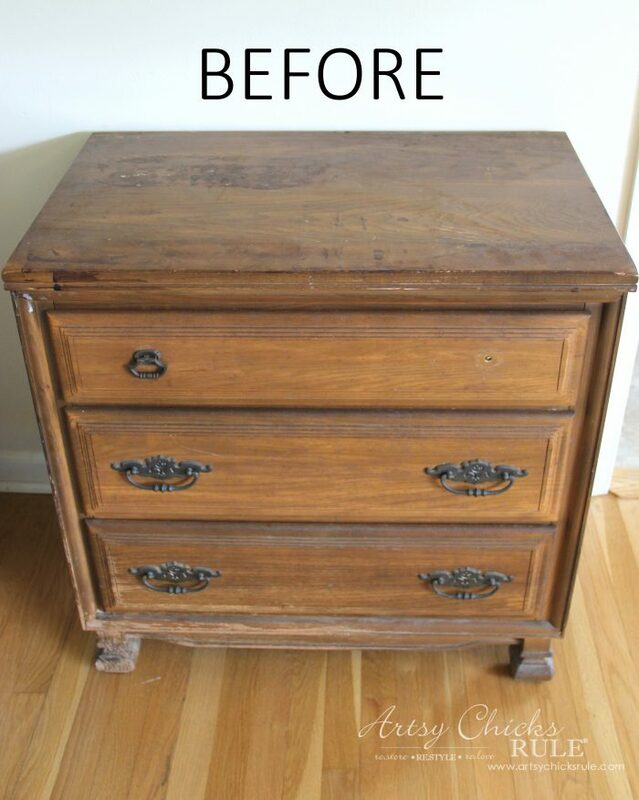 Be sure to check in later to see how I updated this little thrift store find (withOUT sanding!)! Wow, that turned out fantastic! 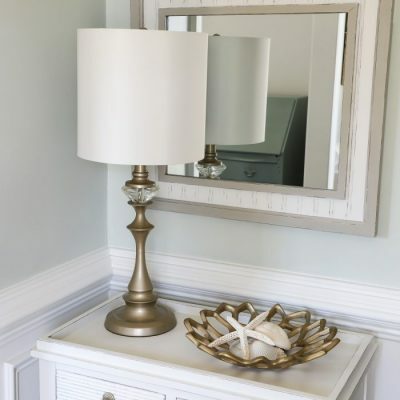 I love the color of the wood and the white just freshens it all up. And I love the deal you got on the PB rug. Love finds like these! Thank you Sharon! It is amazing how different a piece can look. I love the transformations. And yes, the PB rug was a crazy find! 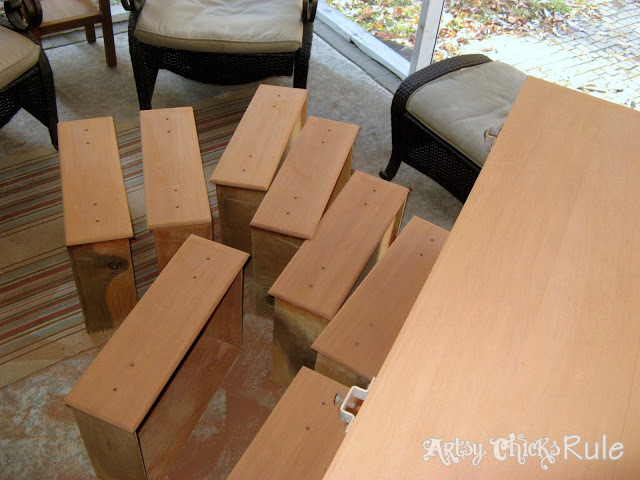 LOVE LOVE LOVE what you did with it.. totally inspired to try something like this out..
I’m so hoping to find something like this to redo for our large big screen TV taking the top drawers out to make room for the dvd plus other boxes. Yours looks great, thanks for the inspiration and making me think I can so something like this soon. 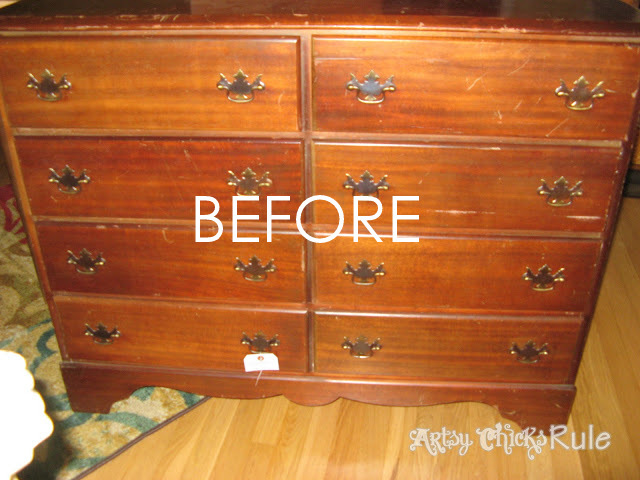 Check out your local thrift stores…I’m sure you can find an old dresser to restore! Sooo much better after! Nice job!! i love the two tone look. great job! And yes, he really does say that. I’ve added to it… (I might even paint you twice!) since I often paint things, once, twice or more. Wonderful makeover you have here. 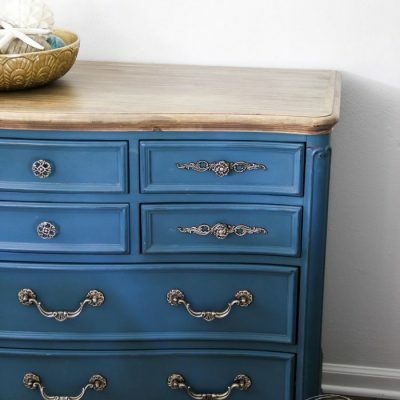 Since you like to paint…then you need to come by and enter my Miss Mustard Seed’s Milk Paint GIVEAWAY…hope to ya there!!! Thanks Linda!! I came by and linked up. 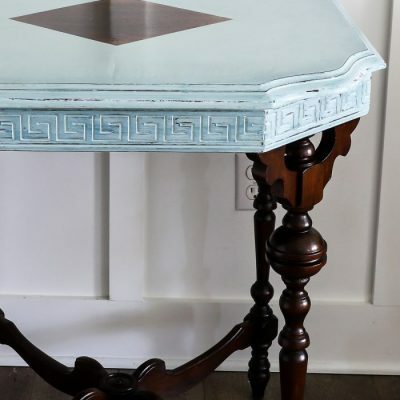 I have had a chance to try MMS Milk Paint!! Would love to! Thanks for the giveaway…so exciting! 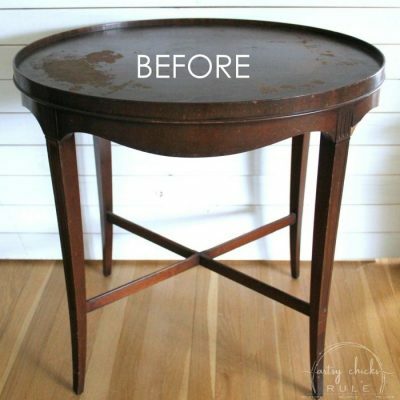 What a gorgeous transformation! Thanks for linking up. I love this piece. 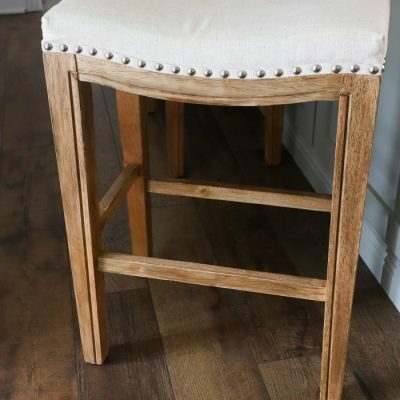 I’ve been waiting for a furniture find where I could use this technique. Glad to meet a fellow junker! Thanks! Yes, I am that! ;) I love transforming old pieces. 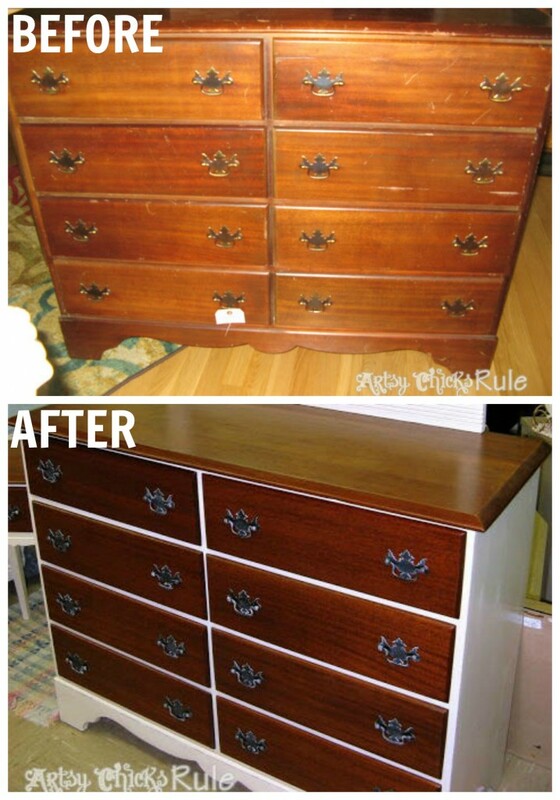 I really need to find a pretty dresser like this! It’s amazing what some paint/ finish can change it’s look. Thank you! Yes, it is amazing….and I’m always surprised by it, every time! It’s just so much fun to do too. Nancy, she turned out great! Sometimes things just need to be restored back to the beautiful wood! I love the piece! Thanks so much! :) I agree wholeheartedly! These old things just need a little love. I recently purchased a double pedestal table made of solid mahogany in a thrift shop as well for only $10 , I painted the pedestals and sides of the table in a taupe tan paint, then glazed walnut over the crevices ,now I need to stain the top , and I chose minwax dark walnut for the color. 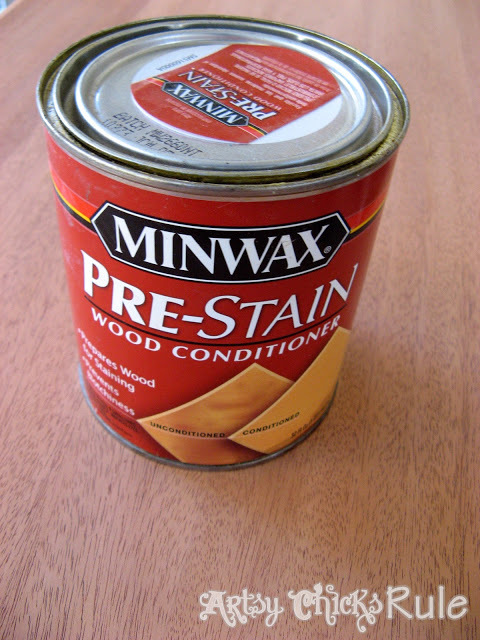 I’m afraid to do this next step because I’m not sure what kind of stain to use. Should I use oil base or water base? After looking at your finished set ( which came out gorgeous by the way. Makes me want to get your expert advice on how to complete my project using the proper materials. I would love your advice. 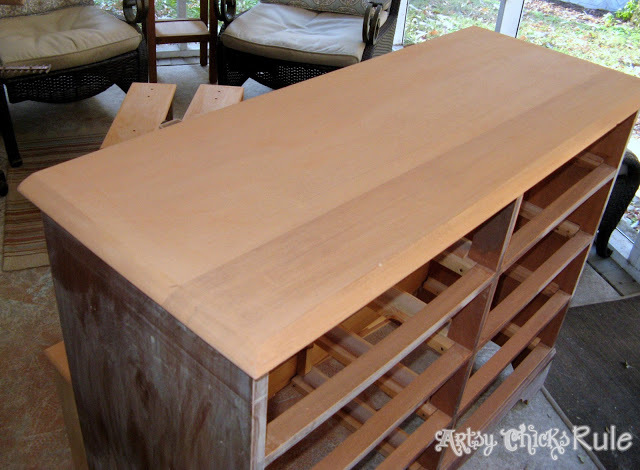 Did you sand down to the bare wood on top? You would need to do that to use the stain you bought. Oil based is what I would suggest, yes. Be sure to use the wood conditioner beforehand too.